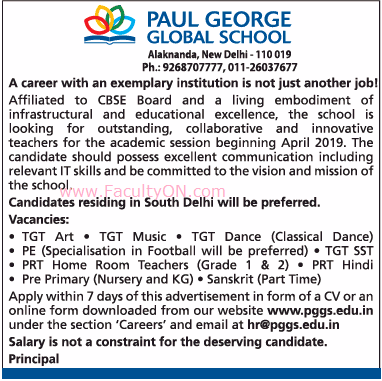 Paul George Global School, New Delhi has advertised in THE TIMES OF INDIA newspaper for recruitment of Teachers TGT / PRT / PPRT jobs vacancies. Interested and eligible job aspirants are requested to apply within 07 days from 5th December 2018. Check out further more details below. About School : After successfully establishing the prestigious St. George’s School in New Delhi 55 years ago as well as establishing Nursing School and Colleges and Muthoot Institute of Technology and Science (MITS) in Kerala in the recent past, The Muthoot Group, one of India’s leading business conglomerates has now its new state of art educational institution – the ‘Paul George Global School’ (PGGS) at New Delhi. How to Apply: Interested and eligible candidates are required to apply in downloaded application form from school website or send updated CV with required documents to the email address mentioned below.